For the doheads. Because the laws are useless. What good is this? Tell this to the uneducated. Way to go. Another idiot. Illegal guns. Attack on shooting ranfes. What next? Who Needs SICK? No Kidding. Just sickening. What next? This is crazy. Knew this all along. Never ending. So tragic and very foolish. Wonder where the crminals get their guns. Good for her. Leding a firearm? Going a bit too far. Once again the system failed. On camera when buying firearm. Crooked cop. Waste of time. In a new study published by the Small Arms Survey estimates that American civilians own owning just under 400 million guns. Worldwide it’s estimated that civilians own nearly 1 billion firearms, with India a very, very distant second to the US. 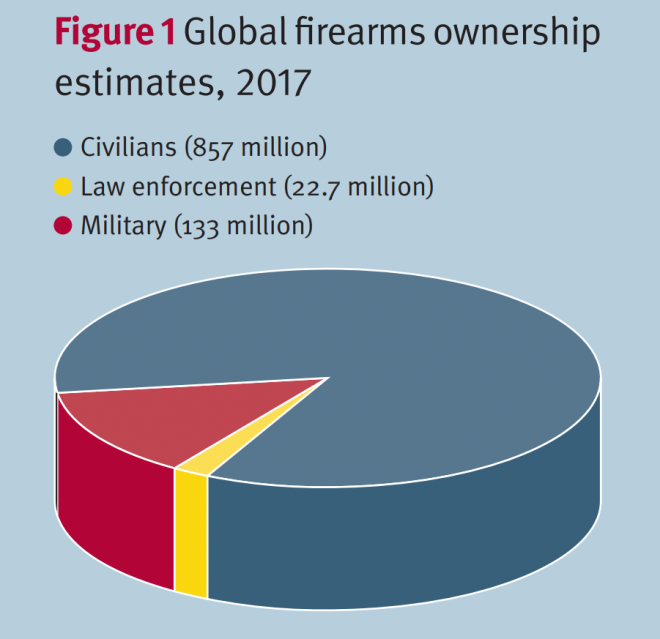 The report published by the Swiss-based research centre in June estimates that the number of firearms owned globally by civilians, military and law enforcement totals around 1.1 billion. With American civilians owning 393 million of those or 40% of the world’s firearms. That’s more than those held by civilians in the other top 20 countries combined. It is difficult to quantify exactly how many firearms are privately owned in the US. There many numbers suggested by numerous sources with estimates ranging between 250 million to as high as 600 million. The Small Arms Survey’s estimations are based upon official firearms registration databases, expert estimates, surveys and comparisons to similar countries on page 8 of their report the Small Arms Survey go into detail on how they computed their estimates. The report makes use of a number of tables and diagrams to break down the data and perhaps the most interesting is he first pie chart, seen below. It shows how over 1 billion firearms around the world are distributed with civilian ownership, at an estimated 857 million, by far the largest group. HOW DO THE NUMBERS BREAKDOWN BY COUNTRY? Just over 10 years ago, in 2007, the Small Arms Survey published a similar report that estimated that 650 million guns were owned world wide. The report also believed that 270 million of these were owned by US civilians. This clear increase shows that the US civilian market is the foremost driver behind the increase in firearms ownership in the world. The latest report suggests that 120 firearms are owned per 100 people in the US. By this metric the next country to hold a substantial number of guns per 100 people is Yemen, with 53 guns per 100 people. Japan and Indonesia have the lowest number of guns per 100 people, both with an average of just just 0.3 guns per 100 people. Small Arms Survey have also created a dedicated interactive map that shows the distribution of firearms globally and by civilian, military and law enforcement ownership. Check it out here. "I'll give you my gun when you take it from my cold, dead hands." The slogan popularized by National Rifle Association (NRA) bumper stickers has been a rallying cry for gun owners over the last several decades. It reflects the sentiment that too many politicians don't respect the individual right to gun ownership ensconced in the Constitution. The challenge for most of gun owners is that amending gun policies isn't usually a give-and-take issue. It's often a take-and-take scenario facing even those of us willing to discuss policy reforms in good faith. Most gun owners aren't really Second Amendment absolutists. We don't want violent felons carrying firearms. We're comfortable restricting gun ownership for people who have adjudicated mental incapacities. We also support reasonable age restrictions for purchase. Even as some politicians suggest we allow teachers to arm themselves in the classroom, I haven't heard anyone call for minor students to carry guns in school. But even those reasonable restraints are concessions of individual gun rights. As best I can tell, gun control advocates aren't credibly offering to liberalize any gun laws in exchange for reforms in other areas. Otherwise, we could have already addressed glaring problems with the National Instant Criminal Background Check System (NICS) through the FIX NICS Act that passed the House in December of 2017. Democrats balked at the idea of requiring reciprocity for concealed-carry permits across state lines. As such, it's truly amazing that ideas like raising the age for certain firearm purchases, Texas's mental crisis gun seizure law, and playing hardball with states who shirk NICS reporting are viable. Even in an environment with no additional policy consideration put on the table for gun owners, modest reforms aren't definitively out of reach. If all this back and forth were really about improving gun laws, we'd have Republicans and Democrats seizing that common ground on politically achievable ideas and making progress. I haven't been shy about my personal willingness to engage, but my phone hasn't been ringing with calls from Democratic policy makers. Modest achievable compromises won't be praised by the NRA or sufficient for anti-gun activists in the headlines. More specifically, reasonable policy consensus isn't the way to raise political dollars. Take the recently formed NoRA Initiative for example. According to reporting by Time, Parkland shooting survivor and political activist David Hogg, Alyssa Milano, Jimmy Kimmel, Alec Baldwin and others have joined forces to "expose public servants who have been stymying gun control legislation after taking money from the NRA." I'm not sure how they plan to "expose" information that is extremely well documented, public and campaigned upon. In most heavily Republican districts, NRA support is a critical advantage for candidates. They're not hiding from it; they prize it. In toss-up districts, candidates are generally smart enough to know whether the NRA affiliation is an advantage or disadvantage, and they act accordingly. Progressives will love and applaud NoRA's "coalition" of liberals and liberals. Conservatives will largely ignore it. The NRA will point to the entity as an attack on gun rights by the leftist elite, raise more money, and increase membership. NoRA literally stands for "NoRifle Association." Gun owners like me don't see that as simply an anti-NRA stance; it's an attack on people who share similar views about the government's further encroachment on Second Amendment rights. It isn't a call for reasoned discussion. On a similar note, the NRA's bellicose recent ads "coming for" the New York Times and warlike rhetoric toward political opponents are equally unhelpful. A "clenched fist of truth" sounds downright authoritarian. As much as I'm a fan of the Second Amendment, the first one is equally important. In fact, protecting the First Amendment is a primary reason I support the Second. I don't want another civil war, but I am adamant about defending the Constitution that's served our nation well. At times, I'm going to agree with the ACLU on issues like free speech. On other occasions, it's the NRA on gun rights. Sometimes it's even stranger. I recently discovered that I agree with Kanye West on the importance of individual political expression. We're spending too much time conflating gun policy reforms with political objectives. If NoRA wants to be the anti-NRA and a political fundraising machine for progressives, so be it. We're free to do that in America. But such efforts aren't about making policy headway any more than the NRA's fight ads. Either we trade equal opposing political blows or genuinely seek common ground. It's incredibly difficult to do both. The latter is far less emotionally gratifying, but it's also more prudent. Gun owners give some ground, and the gun control crowd doesn't get everything it wants. Votes aren't there for a federal ban on AR-15 style guns. Aggressive federal licensure requirements are probably dead on arrival as well. Such compromise might make everyone a little unhappy, but good public policies usually do that. I won't be joining the likes of Hogg and Milano at the NoRA Initiative, but I'm happy to discuss achievable policy reforms. While many gun owners are similarly open to improving gun policies, we're not interested in political surrender. The take and take tenor needs to find a little more give to law-abiding gun owners. That's understandably a tall order for gun control advocates, but it's much easier than trying to pry the guns out of our cold dead hands. Once the gun is deemed a “nuisance,” the owner loses the ability to reclaim or legally transfer it. State law directs that nuisance guns be destroyed without the need for a court order or other judicial proceedings, and courts have confirmed that a person has no “legitimate possessory interest” in firearms for which he or she has no license. The policy of recertification is clear: licensees who fail to comply – by inadvertently missing the deadline, for example – face having all guns, and not just the firearms covered by the license, permanently confiscated by law enforcement officers. Far from being overblown hyperbole, describing the recertification law as “the camel’s nose in the tent of gun confiscation” is not only accurate but arguably, an unduly benign portrayal of a grossly disproportionate regime to enforce recertification through mandatory surrender, police seizure, and destruction of otherwise legal property. Even assuming that license recertification is “a step for safety,” as the NYAGV member claims, it’s not clear how much less secure or safe residents would be if the recertification process included, instead, a grace period for late compliance or imposed a penalty fee for licensees who miss the deadlines but are eligible to recertify. Felons and other criminals are notoriously unlikely to obey gun licensing rules, and state law already makes any weapon that is used in the commission of a crime or that is unlawfully possessed a “nuisance” weapon. Judging from statistics from the New York State Division of Criminal Justice Services (Nov. 2017) on “firearm activity” (based on reports from police agencies across the state), New York residents aren’t significantly more safe since the 2013 gun control legislation was imposed. The total figures for 2016 for “shooting incidents involving injury” and “shooting victims (persons hit)” exceed the totals listed in each of the previous seven years; the 2016 figure for “individuals killed by gun violence” shows a just under ten percent increase as compared to the five-year average prior to 2016. In the same way that anti-gun advocates consistently seek to disguise restrictive gun control measures under the veneer of “common sense,” “gun safety,” or “gun law reform,” they aim to influence public opinion towards “strengthening” gun laws by dismissing opposition to such laws by ordinary, informed Americans as the “mindless” nattering of a handful of extremists. In August, Seattle’s city council unanimously passed the “gun violence tax” that would charge an extra $25 for every gun purchase, and five cents for every bullet. In April 2012, Cook County, Illinois, which contains the city of Chicago, enacted a similar tax on firearms. According to City-Data, between 2009 – 2012, homicides in Chicago averaged 455 annually. In 2013, when the tax went into effect, there were 414 homicides in Chicago, a relatively significant decrease. In 2014 and 2015, however, there were 435 and 465 murders respectively, averaging 450, according to The Chicago Tribune. As of the end of 2015, Cook County’s gun violence tax seems to have had little effect on violence prevention. An NRO chart makes one thing clear: While the gun homicide rate is down 49% since 1993, the number of guns in private hands has increased by 62%. A law in Georgia is allowing for hundreds of people who were barred from buying firearms to slip around background checks, The Atlanta Journal-Constitution reports. According to Georgia law, people who are involuntarily committed for mental health treatment are required to have their records of commitment erased from the National Instant Background Check System after five years. This includes patients who were committed for inpatient treatment, found incompetent to handle their own affairs, or found guilty of a crime but mentally ill; under federal law, however, such people are technically not supposed to possess firearms. "We're pulling them back after five years," said GBI Director Vernon Keenan, whose agency provides the commitment records to the FBI's National Instant Criminal Background Check System. "That's a legal dilemma [because] that person is still prohibited from possession or buying firearms." Georgia is the only state that automatically deletes involuntary commitment records. For the fifth time since 2010, California took the top spot of all 50 U.S. states for enacting the strongest gun laws in a year, according to the most recent annual scorecard released by the Law Center to Prevent Gun Violence. The center, which tracks every state’s gun legislation, published its scorecard Wednesday, near the end of a violent year that has seen more mass shootings than the number of days on its calendar. Among the more high-profile mass shootings this year were the massacres at a social services center in San Bernardino, California; a community college in Roseburg, Oregon; a movie theater in Lafayette, Louisiana; and a historic church in Charleston, South Carolina. On the digital scorecard, the organization ranks all 50 states based on 30 policy approaches regulating guns and ammunition, including strengthening background checks, limiting the purchase of multiple firearms per month and reporting lost or stolen firearms. States receive points for executing effective laws in each policy area. Universal background checks, for example, take priority because laws that prohibit who can possess and purchase firearms can’t be enforced without them, says Laura Cutilletta, senior staff attorney at the center. Each year, the center’s scorecard continues to show a strong correlation between gun laws and fewer gun deaths. States with the weakest laws, such as 48th-ranking Wyoming and 49th-ranking Mississippi, have the fifth and third highest gun death rates nationwide, respectively. States with strong laws, such as California and fifth-ranking Massachusetts, have the 42nd and 49th lowest gun death rates. California has previously enacted some unique laws, including the Gun Violence Restraining Order law, which allows authorities to suspend temporarily individuals’ access to guns if they are viewed as posing a significant threat to public safety. This year, the state passed a measure requiring residents with concealed carry licenses to obtain written permission from school officials before carrying firearms or ammunition onto the grounds of K-12 schools or university campuses. Kansas, which has fallen nine points since 2014 and now ranks dead last, this year repealed its requirement for residents to have a license to carry a concealed firearm in public. The center named the biggest legislative success this year as the new universal background check law in Oregon, enacted in May. Federal law requires background checks only on purchases at licensed firearms dealers, not at gun shows and on the Internet. But seven other states—California, Colorado, Connecticut, Delaware, New York, Rhode Island and Washington—also have laws requiring universal background checks. In 2015, nine states passed laws preventing domestic abusers from accessing firearms. The worst trends of 2015, according to the center, were the law passed in Kansas to allow people to carry a loaded, hidden gun in public without a permit—which also was enacted in Maine—and Mississippi’s measure allowing concealed firearms in a purse, bag or case without a permit. On Monday, Americans marked the three-year anniversary of the fatal shooting at Sandy Hook Elementary School in Newtown, Connecticut, where 26 people died in December 2012. Since the massacre, 41 states and Washington, D.C., have passed 125 stronger gun laws, according to the center. California has taken the No. 1 slot every year since the center first published its rankings in 2010. The group skipped 2011 because it didn’t anticipate publishing a scorecard each year. However, since the center’s legal experts analyze and collect information about gun measures throughout the year, they have proceeded to publish a scorecard each year since 2012. The center was established in 1993 in the wake of a fatal shooting at a San Francisco law firm in July of that year. It aims to provide ideas and different approaches to activists dealing with the issue of gun violence in each state. “We want people to understand the correlation between gun deaths in their state and the strengths of their gun laws to take action and improve their grade,” Cutilletta says. A small Texas school district voted Wednesday night to allow some teachers to carry guns in the classroom. School board members in the Keene Independent School District approved the policy, according to KDFW. The Keene district, located in Johnson County south of Fort Worth, has four campuses. The station reported that the teachers who carry guns would be selected by the district and would only carry a firearm if they wanted to. The weapons would be provided by the district. Other Texas school districts have approved similar measures. Keene ISD Superintendent Ricky Stephens initially opposed teachers carrying firearms in the classroom when he was hired three years ago. Stephens now said the world has changed, and so has his mind. Stephens told KDFW that the fear a student might overpower a teacher and get a gun will not be an issue. Teachers who are involved with kids in higher level grades will not be selected to carry a gun. The policy will go into effect at some point next year, possibly as early as February or March.